[Steve Hoefer] is not a huge fan of traditional table lamps, so he set off to build a reading light of his own that was more aesthetically pleasing than the standard fare. 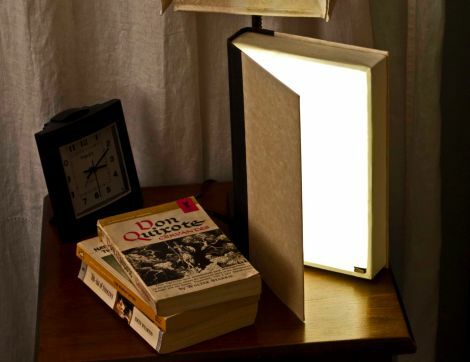 He thought it would be pretty appropriate to construct his reading lamp out of a book, and we’re inclined to agree. He stripped the pages from an old book he found at the thrift store, then built a plywood frame to fill in the recently vacated area. A second frame was built inside the first to support the installation of some warm LED strips as well as the acrylic sheet he used to diffuse the light. A whisker switch was installed in the corner of the frame, which turns the lights on when the book is opened. The lamp puts out about the light equivalent of a 40W bulb, and can be “dimmed” by simply adjusting how far the cover is opened. It looks great on his bedside table, and like some of his other book-related hacks, it’s quite useful as well! Be sure to check out the video of the light’s construction we have embedded below. I love the way you can regulate the beam of light in this design. This is especially practical if you have someone next to you you don’t want to disturb. Great idea. I want one of those! This is great. Beautiful design, “urban ergonomic” aka pleasing to the eye and feels like a more natural light. Need light to read? Open another book! I love the book choice. “City of Light” it’s just so literal. This should definitely find its way on etsy… if its not there already!